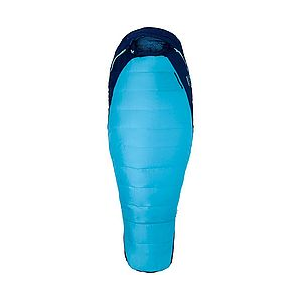 With warmth and comfort for 3 seasons of backpacking, the Marmot Trestles Elite Eco 20 women's sleeping bag uses recycled materials for sustainability without giving up performance or durability. 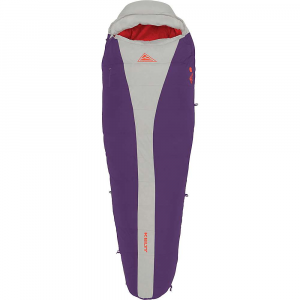 Summer camping in the high alpine just isn't the same without the Marmot Trestles Elite Eco 20 Sleeping Bag: 20 Degree Synthetic. Its compression stuff sack makes it easy to bring along in your pack on your backpacking or bike touring trip. Made from recycled fabric and recycled high loft insulation, you'll not only stay comfortable through chilly nights but you can feel good about it as well. 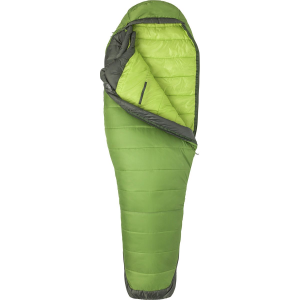 Marmot's HL-ElixR Eco insulation is a unique blend of 3 different recycled fibers that is soft to the touch and with its combination Wave Construction, ensures a high loft for extra warmth. 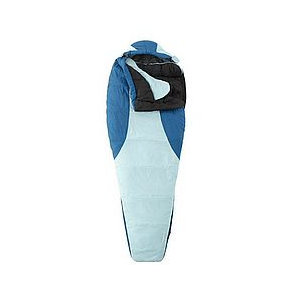 If you get too toasty though, the fold-down second zipper provides added ventilation to keep you comfortable.